Welcome home to this fantastic 2 bedroom/1 full bath upper unit condo. Very bright and spacious living/dining room with hardwood floors. Full size washer and dryer inside the unit. Rent includes water, lawn maintenance and snow removal. 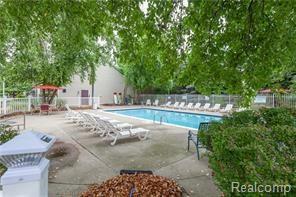 Enjoy full access to clubhouse, pool, and tennis courts. Carport included with the rent. Move in cost: 1.5 month security deposit plus first months rent. Close to shopping & M-59, 1/2 mile from Troy Beaumont - access to Spencer Park from the complex. There is a $40 nonrefundable application fee. All applicants will be charged this fee even if their application is not approved. Any false or misrepresentation on a rental application will make the application null and void and your client will not be reimbursed the $40 application fee. The application fee of $40 per person is nonrefundable. Landlord requires great credit score. If your client has prior evictions or has a bankruptcy record, please call agent prior to submitting your application.